With diesel fuel prices set to soar to almost $2.30 per gallon this June on the West Coast (and $1.70 on the East Coast), the DCI board of directors agreed to release emergency funds last week to help touring corps combat the coming summer fuel expenses. The projected price increases are almost 70 cents per gallon more than one year ago on the West Coast, or 30 cents more per gallon on the East Coast, according to the Energy Information Administration, the informational arm of the U.S. Department of Energy. 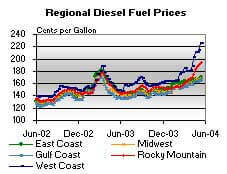 Diesel fuel prices. Graphic courtesy of the Energy Information Association. The DCI board of directors will disburse $75,000 to Division I corps on June 15 and another $50,000 on July 15 above and beyond the normal fees earned through performances, according to DCI executive director Dan Acheson. "The overwhelming majority of votes also supported a move to disburse an additional $10,000 of emergency reserve funds into the DCI Division II & III pay pool to assist touring Division II & III corps with the unexpected costs," Acheson said. George Hopkins, executive director of YEA! (the umbrella organization representing the Cadets and Crossmen), in a commentary on the YEA! Web site, said, "Drum corps are looking at an increase of 30 percent (fuel cost increase over the 2003 rates)." "This is becoming a nervewracking situation," Hopkins said on the Web site. "When we pull into a station -- to fill all up was about $1,200. Now, each evening, we will need to find another $400 per corps. Oh my -- and I doubt this will be changing." Hopkins estimates that the 10 vehicles used by the Cadets and Crossmen will cost $45,000 to fuel this summer, up from $30,000 in past summers. The overall activity-wide impact of rising fuel costs is estimated at well over $300,000. The special disbursement of funds will cover about 40 percent of the total burden corps budgets will face this season, and thus a significant gap will still remain. Acheson said, "I am pleased that Drum Corps International is in a financial position to be able to react to some degree, but I am deeply concerned for the long-term impact that will be felt by corps and ultimately the activity as a result of fuel price increases. We have come a long way in the past several years with renewed enthusiasm seen in attendance at events and through the purchasing of merchandise. Even considering the tremendous growth of DCI's business, the cost for the corps to tour is rising faster than we can keep up with." Corps such as North Canton, Ohio's Bluecoats, who charter buses for the entire summer, will also be affected by the impending crisis. The Bluecoats will still need to fill up its trucks and other auxiliary vehicles. David Glasgow, the Bluecoats' executive director, noted that his corps' fuels costs will amount to $12,000. Most corps are accepting special donations to assist in the effort to raise the other estimated 60 percent of the burden DCI is not able to cover, and DCI encourages readers to dig as deep as you can to help your favorite corps. Acheson said, "I realize DCI and the corps ask a great deal from fans to keep the support coming through various means not the least of which is to fill up their tanks to come to an event, but beyond the emergency disbursement of funds, the next move in the future is to begin cutting down on the miles and the number of shows in a season. We sincerely hope to be able to find a way to not see it come to that."